Is It Too Little Too Late For the Philadelphia Flyers? The Philadelphia Flyers deserve an A for effort over the last six games with wins in all of them. But is it a case of too little too little for the suddenly red hot playoff outsiders? The team headed into their Groundhog Day encounter with the Edmonton Oilers on Feb. 2nd with a mark of 22-23-6 for 50 points and were nine back of a wildcard playoff spot. Playing .500 hockey for the season definitely won’t earn them a postseason appearance, but if they could possibly double their current winning streak they might have a shot at it. They’ll need to leapfrog a trio of teams to make it to the dance in April though. The Flyers have made up five points in the playoff race since play resumed after the All-Star break, however some teams had yet to see action this week. Of course at this point in time the cliche’s will be broken out such as “we’re taking it one game at a time.” Even going one game at a time they need to keep the points rolling in as they have 31 contests left in 2018/19 to climb the standings. Philadelphia’s luck started to turn on Jan. 10th and they’ve won seven of their eight encounters since. It sounds quite impressive, but the current hot streak comes on the heels of an eight-game losing skid when the team was entrenched in the Eastern Conference basement. They’ve run out of management types to fire as head coach Dave Hakstol and GM Ron Hextall already paid the price in December for the miserable showing. Chuck Fletcher was brought in as the new GM and Scott Gordon was hired to take over behind the bench on an interim basis. Things didn’t click right away, but improved play has eventually reared its head. There’s still a long and winding road in front of the club though. On the bright side, the goaltending has improved quite a bit, but the power-play is still the third-worst in the league with a success rate of just 14.1 per cent. The Flyers have outscored the opposition 23-12 in the last half dozen games and have beaten the Boston Bruins twice along with the Montreal Canadiens, Minnesota Wild, New York Rangers and Winnipeg Jets. The victories over Montreal, New York and one against Boston came on the road. The team is firing on all cylinders at the moment, but special credit should probably go to the goaltending, which has long been considered its Achilles heel by many experts. It’s a well-known fact the Flyers have used an NHL-record-tying seven different goalies this season and they haven’t all been magnificent. Carter Hart was recently handed the number-one role and he’s been running with it. The 20-year-old is 8-5-1 on the season with a goals-against average of 2.48 and a fine 92.2 save percentage. It was 25-year-old Anthony Stolarz who earned the recent 1-0 shutout over the Rangers at Madison Square Garden though. Stolarz came up with an excellent 38-save performance to even his record at 3-3-2. He’s got size on his side at 6-feet-6-inches tall, but with a 3.44 GAA and 89.6 save percentage still has a lot of work to do. Recovering from a brutal stretch of games is nothing new in the City of Brotherly Love as the Flyers suffered a franchise-record 10-game losing streak last season. They were eight points out of a playoff spot in early December, but played well enough to finish the campaign with 98 points and claim the third postseason position in the Metropolitan Division. Time isn’t on their side this time however as the team is eight week’s deeper into the season. Still, last year’s comeback and the confidence gained from the current winning streak translates into hope. To repeat last year’s miracle finish the Flyers are going to have to rely on Hart in net. He’s been stellar between the posts since being called up to Philly from the AHL’s Lehigh Valley Phantoms in mid-December. Like all NHL goalies, he’s had a couple of rocky starts, but overall he’s been a model of consistency for a 20-year-old. He set a Flyers’ franchise record along the way too by becoming youngest goalie in team annals to win five consecutive games. That was set in a 3-2 overtime triumph in Boston on Jan. 31st. Since making his NHL debut on Dec. 18Th, Hart is ranked top-10 for netminders when it comes to goals-against average and save percentage. He should get the opportunity to improve his stats from now to the end of the season as Gordon would be wise to give him the lion’s share of work in the crease. Fletcher will have to reassess the team’s position when the Feb. 25th trade deadline creeps closer as he’ll need to decide if he’s a buyer or seller. 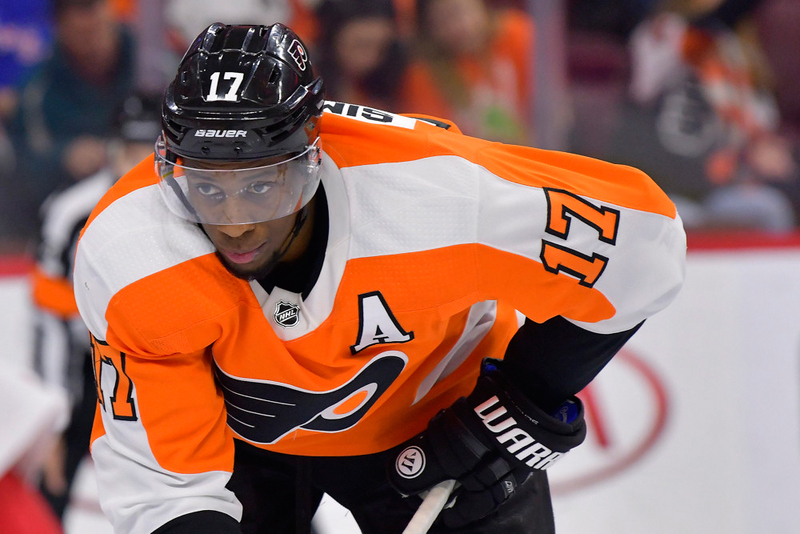 Thirty-year-old winger Wayne Simmonds name has been rumored to be on the trade market. He brings much-needed grit to the team though with 15 goals and is on pace for 24 this year. Simmonds ranks second on the team in the goal-scoring department in 2018/19 and his 90 goals with the man advantage over the last eight years are second to only Alex Ovechkin’s total of 141. Simmonds is an unrestricted free agent come July, but Fletcher would be wise to feel him out regarding his future intentions. If Simmonds is anxious to test the free agency market then Fletcher should receive a few attractive offers before the trade deadline. There are several teams which could use a scoring power forward heading into the postseason, most notably the Toronto Maple Leafs. The Boston Bruins are also reportedly interested in his services. Even if the Flyers can’t make up enough ground to reach the playoffs they’ve at least found a possible number-one goalie for the immediate future in Hart. In addition, if Fletcher decides to send Simmonds packing he should be able to get a good return. In the meantime we’ll revisit the cliche’s. The Flyers do indeed have to take things one game at a time and also need to hope last year’s history can repeat itself.